It’s always great to get together with one of my local tasting groups for a night of fabulous wine, food and conversation, something that has become a rare occasion given my travel schedule these days. 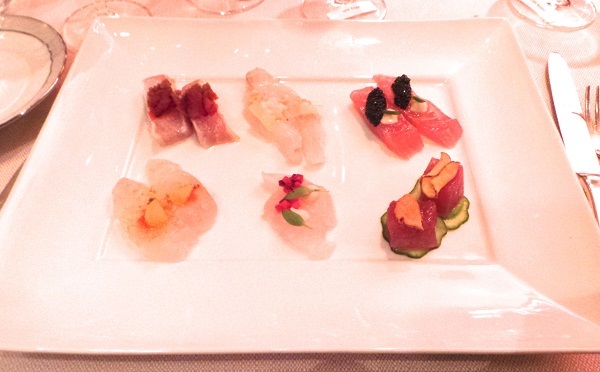 Our dinner at Marea was off the charts, even by the lofty standards that are the norm here. 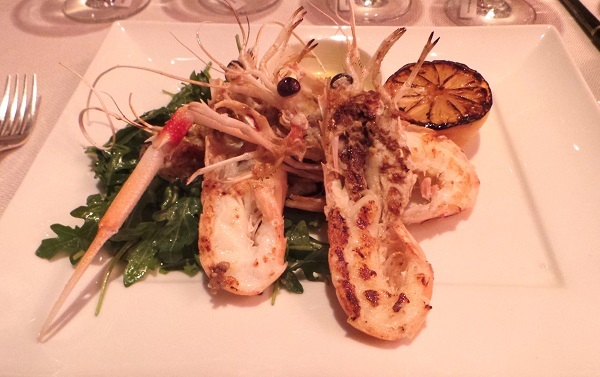 Francesco Grosso, Marea’s Wine Director, put together a fabulous tasting menu to match the wines. Oysters, crudo and Champagne. What could possibly be a better way to start the night? Not much, in my book. The 1976 Dom Ruinart is now fully mature and totally gorgeous. Rich, vinous and enveloping on the palate, the 1976 shows gorgeous depth and purity, with hints of almond and hazelnut that linger in the glass. What a gorgeous wine. A very good, but not great, bottle of the 1979 Cristal follows. Today, the 1979 is wonderfully rich, burnished and ample on the palate. The best examples are also wonderfully fresh, something that is missing here. 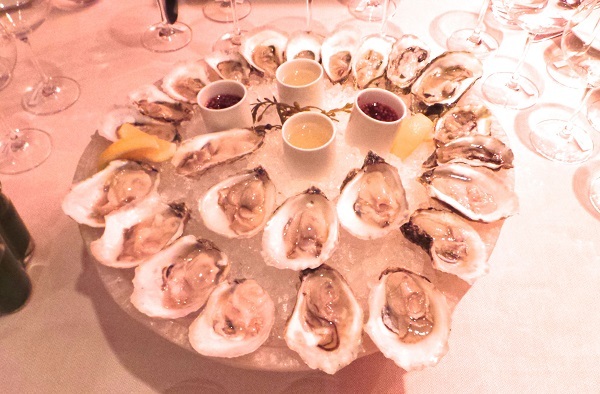 As for the crudo and oysters, well, they are divine. 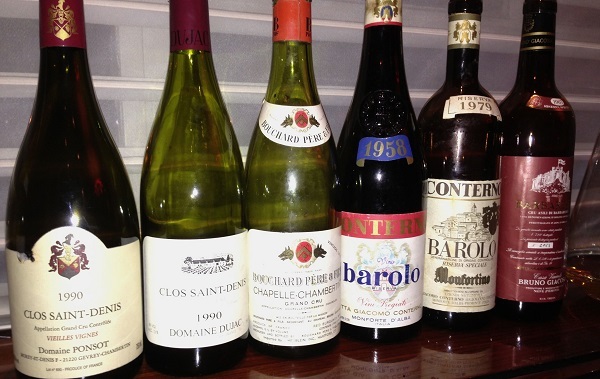 A flight of magical white Burgundies follows. Domaine de la Romanée-Conti’s 1988 Montrachet is surprisingly soft, subtle and nuanced, with modest hints of botrytis adding depth to the butter, orange blossom and apricot flavors, not to mention terrific overall balance. 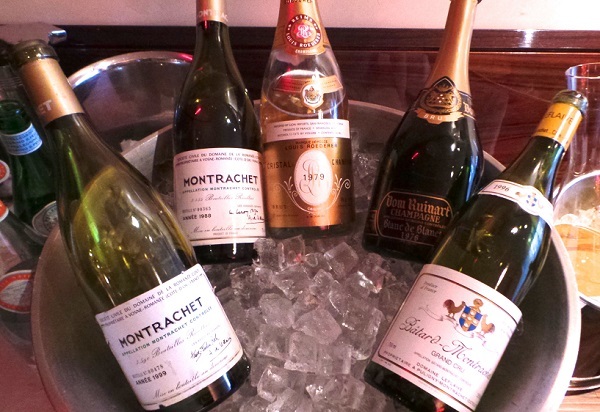 The Domaine’s 1999 Montrachet is much bigger and powerful in style. At fifteen years of age, it appears to still need time in bottle. The style is rich, ample and viscous to the core. Ramonet’s 1983 Montrachet is simply off the charts. Orange peel, almond, graphite, smoke and a hint of petrol wrap around the palate as this dazzling Burgundy shows off its class and pedigree. What a wine. Domaine Leflaive’s 1996 Bâtard-Montrachet is controversial. Some tasters find the sulfur levels too high. I am perhaps a touch more forgiving, as the tension and energy in the glass are compelling. Still, in conclusion, and considering the prices of these wines, none is truly life-changing. Maybe that is an unrealistic expectation, though. The pairing with the langoustine, however, is brilliant. Dujac’s 1990 Clos St. Denis is pure sensuality in the glass. Rich and enveloping, the Clos St. Denis offers endless layers of flavor and depth, all with the distinctly soft contours of the year. Two recent bottles have both been terrific. I place the Clos St. Denis in between the Clos La Roche and Bonnes-Mares in 1990, a great Dujac vintage. A last-minute addition, Bouchard’s 1972 Chapelle-Chambertin is delicious. From one of Burgundy’s most challenging harvests, the Bouchard Chapelle is not a truly great wine, but this is without a question a great bottle that has been lovingly cared for over the last 40 years. The results are in the glass in a silky, caressing Burgundy that delivers the goods. Crushed flowers, dried cherries, mint and sweet herbs linger in the empty glass. 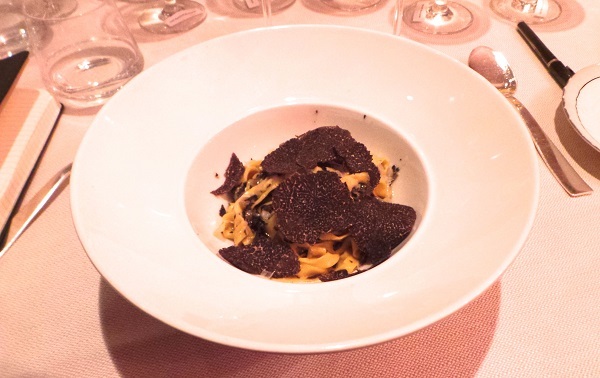 Both wines are terrific with the fettuccine with black truffles. Barolo is up next. Two bottles are corked. Heartbreaking. Fortunately there are backups. Giacomo Conterno’s 1958 Barolo Riserva, from one of the all-time great Piedmont vintages, delivers the goods with superb depth and pure power. A true classic of its era, the 1958 Riserva is rustic, naturally old-school and striking. I am down to my last few bottles of Bruno Giacosa’s 1967 Barbaresco Riserva Asili, the first vintage the maestro of Neive made from this top-flight vineyard in Barbaresco. I can’t think of a better group to drink this bottle with. Sweet, layered and silky on the palate, the 1967 Asili graces the palate with exquisite finesse. Today, the 1967 is clearly at peak, and won’t improve from here. Still, for sentimental reasons I can’t bring myself to open my last few bottles. Marea’s Adriatic seafood soup is bold, deeply flavored and delicious. I suppose technically Barolo and seafood soup might not be the best match, but I always prefer to drink what I like and eat what I like. Dinner ends with an absolutely mind-blowing bottle of the 1979 Krug Vintage, a wine that quickly washes away the bad memories of a few less than perfect bottles. What a gorgeous, gorgeous wine. Even today, the 1979 remains vibrant, classy and chiseled to the core, a poignant reminder of what an epic vintage this was at Krug. Readers who own perfectly stored bottles of this elixir are in for a real treat. In a word: Stunning. Readers planning a trip to New York owe themselves a visit or two at Marea, where the food, service and ambience never disappoint.